If you had told me as I was hobbling around on the Monday after the Mountain Goat that not only would I run Burlington but that I would come in just 28 seconds slower than my New Jersey time a year earlier, given the circumstances, I would have called you crazy. I should have been delighted, especially as my goal was simply to get around in one piece. Instead, such is my perfectionism that, months later, I was still running the race in my mind and wondering how much better I could have done. Now, I was a week out, and completely undecided about running. Well-meaning friends were giving me contradictory advice, but in my heart I knew that only I could make the decision. In the end, three 5 mile runs that got progressively faster and less painful and a 15-mile ride convinced me that running Burlington was worth the risk. As it turned out, I made the right decision, and Burlington immediately became my favorite run to date. The course has everything–dramatic scenery (the fog rolling in off Lake Champlain at gun time was inspirational), great crowds and elevations that presented just the right amount of challenge. And because the course consists of 4 loops (of approximately 3, 6, 7 and 10 miles) that circle back around the downtown area and the start line, it’s a perfect course for spectators as well as runners, as Team Love Nugget (this time around, my son Will and daughter Carolyn) found out, easily making appearances at the start, mile 3, mile 16 and the finish. I won’t go through a blow-by-blow account of the whole run. In fact, the first 15 miles were pretty routine. I went out in what I thought was an appropriately cautious pace given my condition and my experience with the distance, registering a half split that was just under 2 hours, for a pace that was just over 9 minutes/mile. Given that 9:00 was my standard pace for my gentle runs throughout training, I was pretty pleased that I was still running cautiously and steadily, setting myself up for a slower second half and a finish time in the 4:10-4:15 region. It wasn’t until after the last elevation–the run up Battery Hill that began around mile 15–that the problems started. The elevation itself was not overly daunting, and Team Love Nugget were there half way up to boost my spirits, but I had now been out on the course for over two hours and the sun was beginning to beat down. We passed the start line and headed up shadeless North Avenue where, at the water stop at mile 17, we were greeted by a sign that informed us that the race director had raised the emergency alert system to moderate. Not long after, my body capitulated. It was Toronto all over again, only this time, it was worse because I thought I knew better–you just don’t make a rookie mistake in your fourth marathon. I walked. I shuffled. I walked again. I even ran a little, as the course meandered around a bunch of suburban homes toward the Burlington Bikepath and the final 5 miles. But there was one big difference between bonking in Toronto and hitting the wall here, a difference that didn’t occur to me until after the race was long over. The amount of negative self-talk that occurred once exhaustion had set in was unbelievable. I berated myself for not running, for falling behind the pace, for failing. 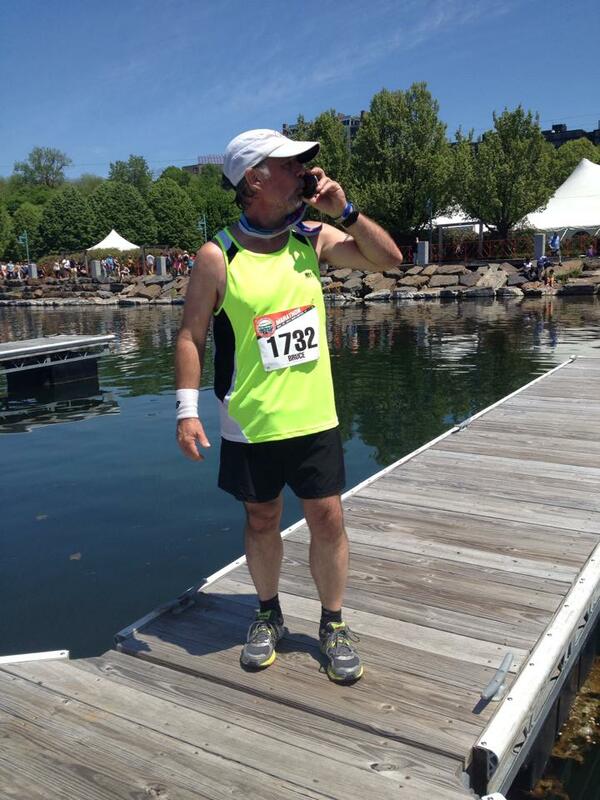 I kept recalculating finish times, and swore at myself as they came and went. I tried to latch onto the 4:15 pace group, only to get angry at myself as they disappeared into the distance. Before the race, Tessa had bought me a copy of Sakyong Mipham’s Running with the Mind of Meditation, and in some future blog, I’ll share my thoughts about the book. I had been trying some of the breathing techniques outlined in the earlier chapters with limited success during training and even less success during the race. I could not, in Mipham’s terminology, tame the horse that was my mind. And the techniques I had used in training to stay focused during my long runs just would not help me transcend my present circumstances. I could not stay in the moment and enable my body to perform at its very best. In the end, the 5-mile trek down the Bikepath seemed to take an eternity, and it was only when I was in sight of the crowd that was milling around the finish area that I managed to coax my body into one last push to the end. Once again, I had survived, and had arguably done better than my training had prepared me to. My time was decent, and there was no sign of the Mountain Goat injury reoccurring. But in replaying the run over and over in my mind in the weeks and months that followed, I found that I had many unanswered questions. Was it the injury-interrupted training? The heat, my traditional nemesis? Was it some kind of mental failure? Or was it some other factor, or combinations of factors, that I had yet to consider? Thankfully, there were still 3 more races on the calendar that I could use to figure it out. This entry was posted in The Flat-Footed Fox and tagged long-distance running, New Jersey marathon, running injury, Running with the Mind of Meditation, Toronto Waterfront Marathon, Vermont City Marathon (Burlington). Bookmark the permalink.